Goodreads Summary: After a bizarre accident, Ingrid Waverly is forced to leave London with her mother and younger sister, Gabby, trading a world full of fancy dresses and society events for the unfamiliar city of Paris. I have to admit that I was first drawn to this book because of the beautiful cover and the sound of the title - I am a sucker for gorgeous covers. But I was hooked by the synopsis. I loved The Phantom of the Opera, and any books set around that time in Paris are books I want to read. Add in gargoyles and I knew this would be a book I would like. After a scandal in London, Ingrid Waverly is eager to escape to Paris. She wants a fresh start, and she also wants to be reunited with her twin, Grayson. She didn't expect to be living in an abandoned abbey surrounded by gargoyles, and she certainly didn't expect to learn that Grayson was missing. Though the Paris police think Grayson is just on an adventure of his own, and though there have been mysterious disappearances, Ingrid knows that Grayson is alive and that he needs help. But her search for him will bring her into a world that she never imagined existed - one in which gargoyles are alive and assigned to protect people. However, Ingrid's own gargoyle, Luc, might end up being a little more than just a gargoyle to her. But with danger all around them, magic in the air and rules surrounding gargoyle protection, can they be anything to each other? And can they find Grayson before his time runs out? 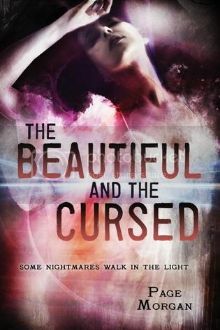 The Beautiful and the Cursed is such a sweeping story, reading just like a beautiful, classic novel. Aside from a few POV shifts, it was easy to get caught up in the writing and feel like I was there on the historic streets of Paris with Ingrid, Luc, and Gabby. I lost myself in the world of gargoyles and magic. There was a rich history surrounding the gargoyles and quite an elaborate world that Ingrid and Gabby found themselves in, and I enjoyed learning all of this background. In some respects, things felt historically authentic - I found myself wishing they could all dispense with propriety rules a few times - but in others, the characters challenged the standards of that society. I especially enjoyed Gabby and her interactions with Nolan. Gabby was no ordinary society lady; instead, she wanted to fight and be fully involved in the new world. I also liked seeing her relationship with Nolan develop alongside the relationship between the one between Ingrid and Luc - they were both different but still interesting and sweet. Although I did love Luc - after all, who wouldn't want a gargoyle like him protecting them - I have to admit that the "I love you, but I can't be with you" construct is becoming overdone. Still, there was so much else in the story that I was able to overlook this. A few moments were predictable, but with the world-building present it left me wanting more and eager to see where Page Morgan takes these characters next. If you like historical fiction combined with magic and writing you can be swept away by, then The Beautiful and the Cursed is the book for you. I look forward to reading more from Page Morgan! Nice review!! I have this in my TBR pile. Have to admit the gargoyle appearances are what led me to nab it while I could! Seeing it pop up a lot lately now too! Look forward to reading it myself one of these days! Once again, great review!